I think this card will see some epic highlights. If I pack this card instead of Kazakus I might just have to be a Grimy Goon. Balance in it's pure form! 67/70 across 7 minions. Lord have mercy. And a 3 card, 15 mana combo that requires insane luck. If you've ever played Hearthstone, you'd know that anything is possible! Could fit into a C'Thun deck, maybe. Works best with c'thun obviously, maybe even doomcaller. But with other minions, you should've played them by turn 7. If it hits Vek'lorr does the Han'Cho buff apply to both taunts? I just got it! 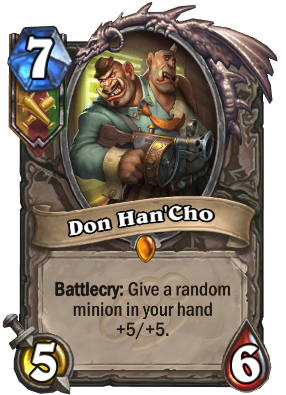 Han'Cho... Hon'Cho... Honcho! That's the more obvious one. The less obvious one is how Han and Cho translate from Japanese: odds and evens respectively, which is constantly the name of the game when it comes to gambling w/dice. mass dispel into shadow word death, why not.